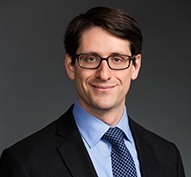 Gibson Dunn | Alterbaum, Daniel S.
​Daniel S. Alterbaum is an associate in the New York office of Gibson, Dunn & Crutcher, where he represents buyers and sellers in a wide variety of transactions in the private equity, financial institutions, life sciences and healthcare industries. His experience includes leveraged buyouts, negotiated sales of private companies, carve-out sales and spinoffs of subsidiaries and cross-border asset sales. In addition, Mr. Alterbaum negotiates complex technology and commercial transactions, including strategic alliances and minority investments, advises on a variety of corporate governance matters, and assists public companies in regards to compliance with federal and state securities regulations. In 2015, 2016, 2017, 2018 and 2019 Mr. Alterbaum was named in the Super Lawyers New York Metro “Rising Star” list in the area of mergers & acquisitions. Mr. Alterbaum received his Juris Doctor in 2012 from Yale Law School, where he served as Editor-in-Chief of the Yale Journal on Regulation and as Features Editor of the Yale Law Journal. He received his Master in Business Administration from the Yale School of Management, where he was named a Dean’s Scholar. Prior to law school and business school, Mr. Alterbaum was a strategy consultant for McKinsey & Company. He graduated with honors from The Wharton School at the University of Pennsylvania in 2007 with concentrations in finance, management and marketing. Prior to joining Gibson Dunn, Mr. Alterbaum was a corporate associate in the New York office of Covington & Burling LLP. He served as a law clerk for the Honorable Christopher F. Droney of the U.S. Court of Appeals for the Second Circuit from 2012 to 2013. Mr. Alterbaum is admitted to practice in the States of New York and Connecticut. Co-Author, “2018 Year-End Activism Update,” Harvard Law School Forum on Corporate Governance and Financial Regulation (April 15, 2019).